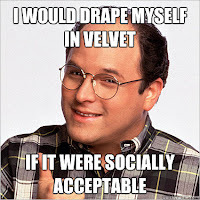 George Costanza makes more sense than gun nuts. These people believe that the US government is eventually going to go street by street and enslave our citizens. Now as long as that is only happening to liberals, homosexuals and democrats - no problem. But if they try it with anyone else - it's going to be arms-ageddon and these committed, God-fearing, brave souls will then use their military-esque arsenal to show the forces of our corrupt government whats-what. These people think they meet the definition of a "militia". They don't. At least not the constitutional one. And, if it should actually come to such an unthinkable reality, these people believe they would win. That's why they have to "take our country back". From who? From anyone who doesn't think like them or see the world like them. They hold the only truth, everyone else is dangerous. Ever meet a terrorist that doesn't believe that? Just asking. George has really stepped in it now. Tim McCarver is what he is.